How Can I Find My Family Tree on My Family Root? By building your genealogy you can easily trace your ancestors and distant relatives. It will help you to understand your family history. My Family Root is an online family tree maker which delivers you a platform to create your own family tree. Do you know how to find your family tree on this website? It is very simple. First you have to click www.myfamilyroot.com. Then you can see the entire website. At the top, there are various links like ‘About Us’, ‘Families’, ‘Contact Us’, ‘Blog’ and ‘Register’. By clicking these links you can easily traverse to corresponding pages. On ‘About Us’ page, you can see more details of this product. You can easily contact myfamilyroot through ‘Contact Us’ page. For reading blogs take ‘Blog’ page. By clicking ‘Families’ you can view all registered families. While seeing these families, if you wish to see your family name in this list, then please register your family by clicking ‘Register your Family FREE’. Family registration is absolutely free. Before building the family tree, family members should select a member as family admin. Then he can collect the details and start creating your ancestry. 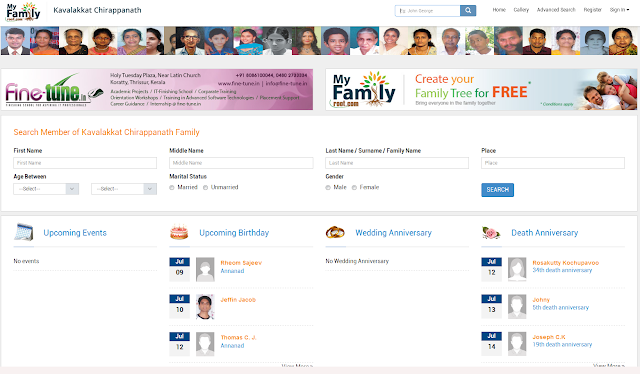 If you want to view more details of your family, just click on ‘Families’. Then click on your family. You can easily traverse to your family tree homepage. Here you can see various upcoming events in your family such as birthdays and wedding anniversaries. Upcoming death anniversaries can be seen here. At the top, you can see an attractive colour banner of member images. You can easily trace the details of any member by clicking that member from this banner. If you click a member, you can see his or her family tree. The selected member will be highlighted by yellow colour. His siblings will be shown in the same level. His parents who belong to previous generation will be in upper level. The member who appears beneath to him after ‘&’ symbol will be his partner. Level three indicates his children. If you want to see more details of selected person, just click on ‘Profile’. There you can view his family members. By clicking their name or photo you can easily traverse to their profile as well as family tree. These details can be shared through Social Medias like Facebook, Twitter, LinkedIn and Google Plus. At the top, a search box is provided so that you can easily trace any member. To view the gallery images of your family click on ‘Gallery’. If you don’t know much about a member, advanced search will help you. By giving the known details about him you can easily trace that member. If you don’t know your username or password to login to your profile, then you can request your login details to family administrator by clicking ‘Request for Login Details’. After getting this, click on ‘Sign In’. Give your username & password & click on ‘Log in’. Here you can edit your privacy preferences by clicking ‘Edit Privacy’. If you want to change your current username and password, click on ‘Change User & Password’. By clicking ‘View in Tree’ you can see your family tree. To view your public profile just click on ‘View Public Profile’. This is the way by which you can find your family tree on this online family tree builder.